These oat shortcakes with summer fruit are vegan friendly and can also be adapted to be gluten-free. Makes a great dessert or sweet addition to brunch! I grew up thinking shortcakes were those little round spongy things next to the strawberries at the grocery store. My parents would buy them from time to time, along with strawberries and a can of whipped cream, for dessert. They were so tasteless and gross that often times I just ate the strawberries and whipped cream, leaving that hockey puck of a cake behind on the plate. After getting married and realizing that food tasted so much better when made from scratch, I spent a lot of my time off of work watching my favorite chefs, Ina, Paula, Alton, & Giada, on Food Network. Someone made strawberry shortcakes one day with these things that looked like a biscuit and I was like, “that’s not a shortcake.” I mean, I knew because my mom used to buy shortcakes at the grocery store and they obviously had to be similar to those dry spongy things, right? Well, imagine my surprise when I googled shortcakes and found out that traditional shortcakes were in fact these scone/biscuit like cakes. Apparently, the short in shortcake comes from the high amount of fat used in these cakes, which back in the day was commonly referred to as shortening. 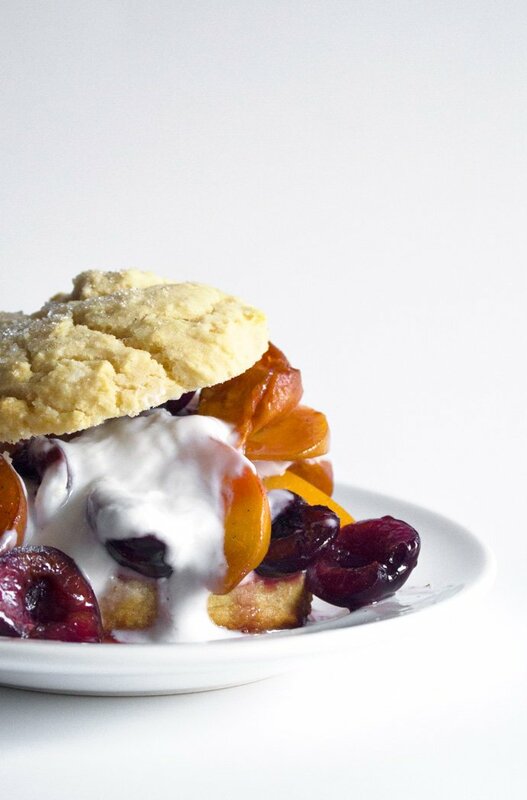 The dense, scone or biscuit like texture was the perfect base for syrupy fruit and cream. Today, almost anything with cake, cream, and fruit can get away with the term shortcake. My mom’s version of strawberry shortcake is layers of butter cake with strawberries and whipped cream, which I put a healthier twist on in this recipe. Sticking close to the classic, this version of shortcake has a blend of flours, including oat and almond flour, which add both flavor and moisture. They’re very tender, moist, and only subtly sweetened with maple syrup which makes it hearty and wholesome enough to enjoy for breakfast/brunch, yet pretty and sweet enough to serve for dessert. We topped ours with a yogurt cream plus lots of fresh summer fruit and made it our sweet addition for brunch! 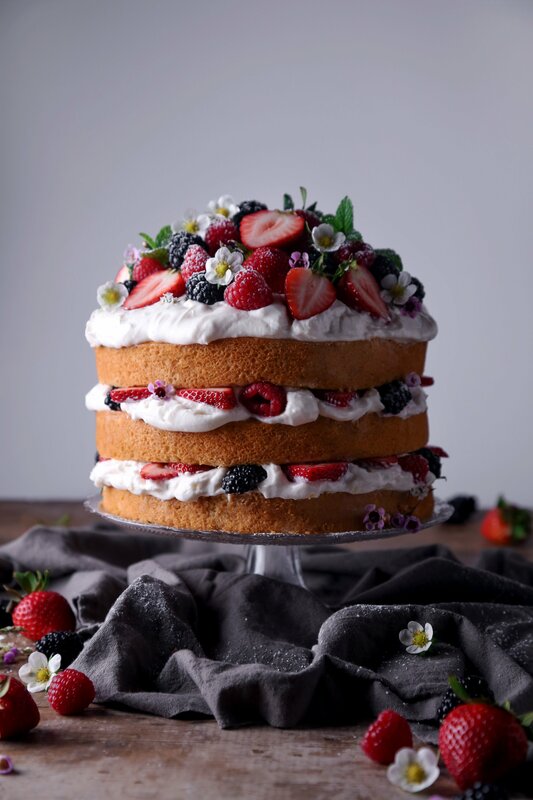 Whichever version of shortcake you prefer, this is the perfect way to use up the abundance of fresh summer fruit out in the markets right now. I hope you give it a try and enjoy it as much as we did! These shortcakes with mixed summer fruit are delicious enough to enjoy for dessert, yet wholesome enough to serve for breakfast as well. The shortcakes are made with a blend of flours, including oat and almond and topped with fresh fruit and a whipped yogurt cream. It's vegan friendly and can be adapted to be gluten free as well. Preheat oven to 375ºF. Line a pan with parchment paper or a silicone baking mat and set aside. In a large mixing bowl, blend together flours, baking powder, and salt. Cut/blend in coconut oil/butter, until mixture is crumbly and no large chunks of fat remain. Mix in milk, sweetener, and vanilla, stirring just until combined. If dough is too dry, jut add a little more milk. Drop large spoonfuls of dough onto the baking sheet, leaving a few inches in between. I like the rustic look of drop shortcakes, but you can pat it into a smooth round if you prefer. Either way, it should make about 6 large shortcakes or 8 smaller ones. Sprinkle with turbinado sugar and place pan into the preheated oven. Bake 15–20 minutes, until lightly browned. Remove and let cool completely before topping with fruit and cream. Top cooled shortcakes with fresh fruit and yogurt cream. If you like syrupy fruit, you can macerate the fruit ahead of time in a few tablespoons of honey or maple syrup (sugar can also be used.) Makes 6 servings. *You can make oat flour by grinding whole rolled oats in a coffee grinder, food processor, or grain blender. I find that my coffee grinder grinds the oats more finely than my food processor. Be sure to measure the oat flour after grinding. OMMGGG this looks like a feast. It doesn’t even look like it’s made at home. Looks like its from a restaurant. Would make a great centerpiece! Aw thank you Oyinkan! You made my day I hope you have a wonderful week! This looks so good! I’m saving this right now. This dish looks delicious. I love all the fruit. The display is simply fabulous. Saving your recipe !! Thanks for saving it, Cynthia! Please let me know if you try it out. Have a fun weekend! Yes please do. The fruit pizza is so much fun to make. I hope you both enjoy! Those look positively delicious! I love shortcakes with fresh fruit, it’s perfect for hot weather when you need to satisfy the sweet tooth. OH my goodness, this all looks so delicious! the lemon cake should be up on grab, wanna have it right now;). Lemme try out baking it if I can this weekend! Please let me know if you bake it. I’d love to hear about your results. Have fun! This is so colorful! I’ll have to try it! Yes it is Sonyo. Getting the right shots take time. Thank you. I appreciate the kindness! Let me start off by saying your photos are amazing! Thank you for the kind words, Jennifer! Have a great weekend! First of all your pictures are magnificent! Second of all..I am making these for my family LIKE this week! Wow! Thank you Perri! I hope your family loves it as much as we have. Have a lovely weekend! This looks so beautiful and summery. Very similar to the traditional scones with strawberries and cream that we have this time of year, but much more satisfying using the oats – not such a sugar rush! Will have to test this version out! Yes, please do. Let me know how you like it. I’d love to hear your feedback! Thank you Puja! You’re so kind and always encouraging! This is a master piece! I remember ONLY having the hockey pucks in my strawberry shortcake. This recipe looks amazing I am saving this one for later no doubt! Wow, thanks for the compliment David! This really encouraged me. I hope you have a wonderful weekend! Totally just pinned this! Shortcake is my fave!!! MOUTH WATERING!! I love that you keep the recipe as healthy as possible to satisfy my sweet tooth!! Your pictures make me want to make this ASAP. Thank you for sharing! Aw thank you so much Brooke! I really appreciate it! LOL – I grew up with real shortcake – and a grandmother who was adamant that they were the only possible shortcake! They are one of my favorite ways to use fruit… Those look good! This looks absolutely amazing! I agree when you said that anything with fruit and cream topping can “getaway” as a shortcake. I once found a recipe and did not think it tasted great at all – maybe it was one of those “anything” ones.. Or maybe I did not make it right, ha ha. Bu this healthy oat one you made looks like a great breakfast dish!! Thanks Zan. If you try it out, please let me know. I’d love to hear your feedback. I appreciate the kind words! Your pictures are stunning my friend as ALWAYS!! :D:D I love this beautiful oat shortcake cake! and how you have piled and decorated it with berries! I used to watch a lot of food network too and have learnt a lot from there! and I agree my kids are so spoilt now, that they want only homemade food even for their birthdays! sigh! Gluten free!! Cant wait to make this soon! I have such a hard time finding good gluten-free bread based stuff. The cream and berries is awesome! OK I am bookmarking this blog because these look absolutely amazing. There is something so special about a beautiful dish done beautifully. 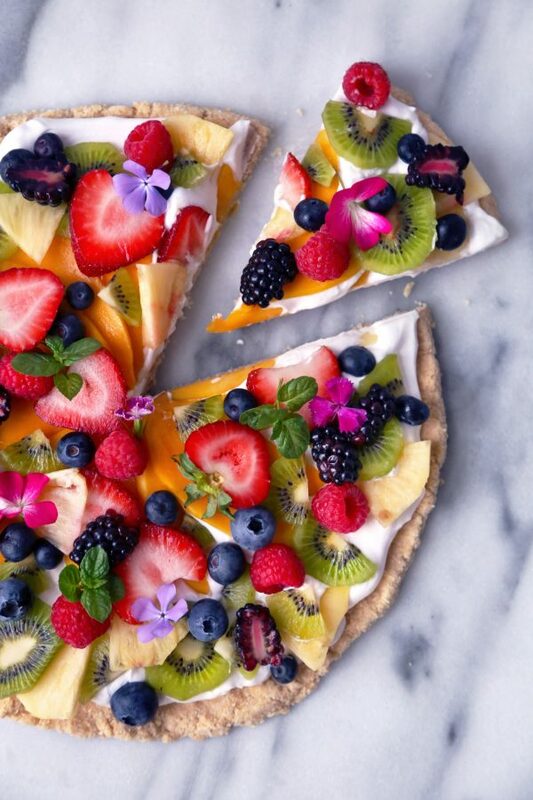 I need to try that fruit pizza. Thanks Amanda. I really appreciate how encouraging you are. It means a lot to me. I hope you have a wonderful, fun weekend!